I've got 3 classes all ready to go. Here are some pics of the projects just to get you interested!!!! I LOVE the Graphic 45 Steampunk 8x8 canvas board collage here using Tim's new Artful Dwellings die, stamps and Idea-ology. Then of course, the Loaded Chunky ATC is so much fun packed into a small work of ART you can set on your desk. It is definitely "loaded" with Tim Holtz Idea-ology pieces. And it has Ten Second Studio embossed metal on the back. It just makes me smile. And the last one........this is so adorable. You can bring your own pics to put in this if you like. But I love the vintage boy and girl I bring made from my own personal stash of vintage cabinet cards. We'll use embossed metal on mini canvases. And the fun using the metal with Alcohol Inks - AMAZING!!!! Again, right up my alley!!! So, stay tuned, check out the sidebar for dates. We set the one for Elmhurst, Ill. at Creative Cuts and Crafts yesterday. YAY!!!!!! We'll be there April 29 in the evening for one class and then Sat. the 30th for 2! And don't forget Memory Bound in Ankeny, Iowa on June 4-5. Their newsletter will be coming out soon with all the details, so check it out! Can't wait to see all you "Inky Fingers Friends". Shall we start a society??? I've been busy getting classes together, written up, product ordered, etc, etc, etc. But I thought I'd share one of the Artful Dwelling houses that I've been playing with. This class will have vintage photos from my private stash for you to choose from. I liked this one, but it didn't make the cut. You will love these little beauties. Each one a tiny work of ART. I think this class and the others will really expose you to all kinds of different techniques that will help you create a piece you will love. Stamping again, and I LOVE the way it really makes your project so cool. This is a piece of cardboard that I used to spray Perfect Pearls Mists and Adirondack Color Washes on. I was spraying the Flourishes after I'd used the Mist on Rosette strips...see them? But the pattern really jumped out at me...but then I am easily amused!! ha! So keep warm.... it appears that Old Man Winter is back in the neighborhood here....hrumph! Well bloggers, Friday is here, and Bill picked the 2 winning numbers. Happy v-day Linda and thanks so much for the Graphic 45 giveaway opportunity. Love how you used and distressed the metal. Santa will definitely be bringing a Vagabond to me this year! I'm always amazed at what you do with metal. These are awesome. You have more courage than I do, I'd be so afraid I'd break my machine I would never try what you did on the Vagabond-LOL! Well Elaine, it took me quite awhile to get the courage, but now I'm a maniac!!! Measure with a ruler, the height of a regular sandwich you use and you have the idea. Of course, I tried it first through the Cuttlebug just to be safe!!! You ladies get me your addresses and we'll see that the Graphic 45 papers get out to you right away!!! Sun is shining. It's 45 degrees and the Cardinals are singing away. And I'm going to learn to use Precious Metal Clay tomorrow in a class. Fun time!!! Linda and Bill the Selector of the Winner! OK bloggers! You've got one more day to comment for the prize on the previous post for the Graphic 45 Le' Romantique paper pad. But, I had to show you the beautiful card I got in the mail from Lynne Forsythe!!! I LOVE it!!! So vintage and colorful all in one. She did a fantastic job, and it made my day. Check out Lynne's fabulous blog here for her great ideas. You won't be sorry. Then I thought I'd show you a pile of some of the things going into my upcoming classes. Keep checking the side bar for confirmed dates. We still have a couple of months, but I am slow....so I start early. These are the metal numbers from Tim with UTEE Brightz on them. I WILL do a short tutorial on them for those of you who've asked. Pretty simple, but pictures help to understand....so stay tuned. It's 57 degrees here, and the snow is slowly melting into the ground. But our lovely sunshine from days past seems to have taken a day off. Oh, for Pete's sake, as I sit and type this, the sun came out!!!! First time I've seen it today....hey, maybe I'll try that again. Ha! Be well and Be good to each other. We're all we've got! Happy Valentine's Day ! And 2 Graphic 45 Prizes! Happy Valentine's Day everyone. The sun is shining, the birds are singing, the snow is melting, and I can see grass again! I'm playing in the studio. I call it experiment time. I tried embossing metal yesterday for the first time with Ten Second Studio molds through the Vagabond. I've always been a bit timid in using the V with my own experiment sandwiches...but I measured and tested and found a good pattern. So Success!!! This is the Rock Star Black metal on the bottom. One of my personal favs! Next I decided to cut out hearts and use paint on them for valentines. This is Ranger's new Metal Foil Tape and red craft paint added, then swiped off for a cool Shabby Chic sort of effect. Now this was pretty cool. Tim's new Adirondack Color Washes on TSS metal. Emboss it, spray it, heat set, and sand off. We'll be using this in a new class coming up. Pretty Cool!!!! I used the Espresso and Red Pepper on Dijon metal. So enjoy the day. Play with your supplies, order more, do whatever. It's a beautiful day in the neighborhood and Spring can't be too far off, can it???? As an afterthought I saw Graphic 45 is having a romantic drawing today here. So I've got 2 Le' Romantique 8x8 paper pads to give away!!!! Leave a comment and we'll have Bill draw a number for 2 prizes. What better way to share the love than the gorgeous papers from G45! I have to say, this probably was one of my favorite pieces that I did for CHA. I am crazy about the combinations of Brown, Tan, Red and Black. I've always been drawn to them. Here is the new Kraft Glassine envelope as a base, then red cardstock. The Kraft Resist is next up, with Distress Inks and stamping. Then a layer of red cardstock stamped. The Kraft Resist paper is so over-the-top fun to work with!!!!! The Memory Frame has the new Pen Nibs, which I just LOVE, on a piece of the new Crowded Attic Paper Stash. The background paper is from that collection as well. The Word Stick, Spinner and Hinge Clip speak for themselves. That's it for the CHA projects, I think. Keep checking the sidebar of my blog for updates. It should be a very exciting new year!!!!! Here's a couple more pieces I made for the Ranger booth. The first on is with Alcohol Inks and the new Metal Foil Tape. The background is my personal favorite in the new Kraft Resist papers from Tim Holtz. Soooo cool! You will love this stuff. Making a class to use it. Can't wait !!! This is highlighting the Memory Frames. I used the Steampunk Debutante papers from Graphic 45 and Tim's Sprocket Gears with some Metallic Mixatives. The Lavish Trim ribbon was so easy to die to coordinate with the papers using Adirondack Color Washes. Tomorrow is the last of the cold streak for a few days....40 degrees on the way. Whoo Hoo! So easily amused. Here are a couple of tags I did for the Ranger booth at CHA. This one used Tim's new Kraft Glassine Papers. This stuff is really so cool to work with. Fun to stamp and cut out with dies. I used the Tattered Florals here with some Foliage pieces. This is a #8 Manila Tag from Ranger. The stamp is one of my favs from Tim in the Regal Findings Collection. This tag has been run through the Vagabond with a Texture Fade Regal Flourishes. I used Distress Inks and Perfect Pearls Mists. The Salvage Stickers are from the Tim's new collection Crowded Attic. I LOVE the little girl from Gale Blair's Paper Whimsy papers on a Facet. She is brilliant with what she does to vintage photos. I also used the Baubles and Lavish Trimmings died with Dusty Concord Distress Ink. Just a short post tonight. Had to see the Packers win the Super Bowl, but more importantly...the new GLEE! Finally! Be well and stay warm!!!!!! I really had fun making this clock. 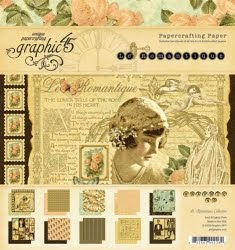 Little needs to be said about the fantastic line of Graphic 45 papers Steampunk- Debutante. They are stunning beyond belief!!! Unbelievable detail and color. Way to go G45! I know I've had this pad of paper for ages, but just didn't know what I wanted to do with it, so I thought about it. After all, Alphonse Mucha is my all-time favorite ARTIST! Gorgeous works of art I drool over. This is one of my favorite sections. I used watch parts from my local bead shop Pumpkin Glass...worth a trip from anywhere. Taking a class in PMC there in a couple of weeks. Check them out! Tim's Foliage and Sprocket Gears are scattered all around and a couple of gears Bill found for me. Copper Metallic Mixatives brushed on the flower that's layered with a Timepiece and large Game Spinner. You can find tons of Ranger and Tim Holtz products at Joy's fantastic site Inspiration Emporium. And $5 shipping right now! Pre-order the new Alterations Dies, too! Glossy Accents are on the wings of the dress form, the Rose, and the Time Flies piece. Also added it to the 2 butterflies for dimension. The large black wings are German Scrap from Red Lead. Layers and layers of paper and chipboard. I just like to load it up. BUT be careful of too much, make sure that your clock hands will turn! Luckily I could arrange it so it still functions fine. The clock is from Bare Elements. I added a bit of Alcohol Ink here and there to make some of the watch parts stand out better...see the turquoise colored winding knob. This was the most delicate. Tweezers helped tremendously here. See the pointy gear to the right? Make sure it's far enough away from clock hands so it doesn't interfere. All the papers came in the 12x12 pad. You MUST check out the 3 new lines at Graphic 45.........stunning, simply stunning!!! But I fell in love with the color combo in these papers the minute I saw them. Over-the-top gorgeous all by themselves. I had almost forgotten about this project. It was the first one I did for Tim. Candy C showed it on her blog with a great picture, better than the one I could get, and I thought you might like to see it. This was so much fun working with copper and silver sheets of metal that I embossed with 9 different Texture Fades from Tim's Alterations. This metal is from Streuter, not the new Metal Foil sheets from Ranger, but the technique can be done with several different products. I made this before I ever knew about the new product from Ranger to show off the Alcohol Inks and Texture Fades. Then I put them on small square canvases from Blick. Add the Alcohol Inks and various Idea-ology pieces, and the Numbers with UTEE Brightz. Very cool process with the UTEE. We've had Thunder Snow here and Lightning for several hours. The wind in incredible. Drifts 5' high in back of the house. But so far, no ice!!! !